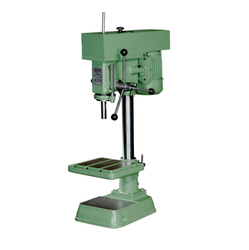 We provide a qualitative range of Bench Type Drill Machine which are efficaciously used in several drilling purposes. The machine is configured on the lines of latest technological procedures, which characterizes it with significant features like highly functional, sturdy structure and energy efficient. • The world table fitted with the bench type drilling machines can be elevated, lowered and swung through an angle of 360°. 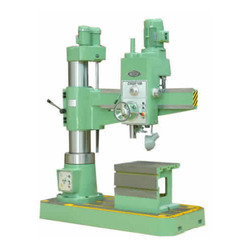 We are one of the widely acclaimed manufacturers and suppliers of Bench Drill Machine. 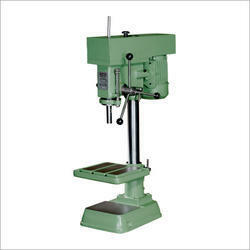 We offer Radial Drill Machine which finds their extensive usage in several drilling purposes. The drilling machines that we supply display unwavering performance when drilling works are undertaken and that becomes possible due to the presence of drilling heads with longest possible radius from the columns. The base has a casting of heavy proportion with the rigidly cross-ribbed underside, which enables the machine to withstand heavy loads. Drill Power 1.5 Kw. 3 HP 5 H.P. Arm Elevating Motor 1 HP 2 HP 3 H.P. 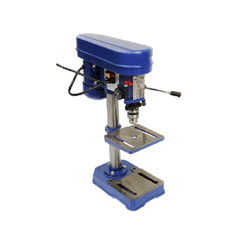 Our array of Pedestal Drill Machine are used in drilling land/other masses. These drilling machines are designed and fabricated with the assistance of latest technology that leads to the optimal production of drilling machines with technically superior features such as rapid and quality operations. Drilling Capacity 1/2" 3/4" 1" 1,1/4" 1,1/2"
Spindle Travel 3¹/²" 5" 5" 5¹/²" 6¹/²"
Base to chuck 18" 24" 42" 26" 6.1/2"
Table to chuck 13¹/²" 31" 32" 42" 49"
Centre 7¹/²" 10" 10¹/²" 11" 28"
Table Size 8¹/²" 12¹/²" 13¹/²" 14¹/²" 19.1/2"
Column dia 2" 2¹/²" 3" 3¹/²" 4"
Column height 33" 48" 55" 60" 60"
Motor 1/2 H P. 1 /2 H P. 1 H.P. 1 HP. 2 H.P. Looking for Drill Machine ?